We had a fantastic time at this year's Knapp Vineyard's Roadster Rally and look forward to coming back next year! ABSOLUTELY AWESOME!!!!!!!!!! I don’t know how else to describe it. My wife and I have been doing this for 13 years (we live in Breesport, just outside of Horseheads) and this one was perhaps the sweetest one so far. Glenora Run (Route A, created by Terrie Sauter) was awesome. The sponsorship of our run by Glenora Wine Cellars and Welliver is awesome. They are a class act, from breakfast buffet to a parade lap at the Schuyler Hospital to lunch at Hidden Valley! The coordination between city, village, county and state is incredible. The fact that they have the guts to shut down Franklin Street and surrounding territory is to be highly commended. The crowd was huge, respectful, responsive and encouraging. I talked to a man who comes down from Montreal, who had left there at 5 am. He brings his whole family, including his Dad who raced in the 60’s) and they were camping at the track, they’d started coming 10 years ago, and he said, “Do you realize, this is the only thing like it on the east coast?”. Yeah! The only thing like it on the east coast and it’s happening in Watkins Glen. So, thank you Casey and all the workers. Words simply fall short of trying to express my gratitude and thanks for being able to participate in a very, very special event. Thank you to all the elected and non-elected officials, the police, sheriffs, troopers, first responders, EMT’s and hundreds of volunteers who put on such a unique event. And thanks to WGI, the SVRA, the drivers, teams and cars that really put the cherry on top!!! Stonebridge Drivers - “We Drive the Old Course"
I want to add on to the esteem and awe I feel for the organizers of this event. Each year they tweak and adapt to conditions and manage to not just maintain the high quality experience for the participants, but actually improve it - specifically the wait time between the staging and the start of the laps. It went incredibly quickly for me this year, and I appreciated it as my car was inclined to overheat when stopped, and vapor lock when hot. Kudos for that. No doubt Casey’s group was a bit miffed by the pace of an older Daimler, but the track opened up when they were waved off, and as the first car behind them, I never had a better time trying to keep up with the car in front. Of course first I had to find them, and my supercharged B had a pretty wild sprint up the hill until I found them at the stone bridge. Great Fun…. but again, great appreciation to the organizers and volunteers coordinating all this and making it happen each year. Well done. We also were part of the Glenora run. Fantastic job! Excellent food and the hospitality by all there could not be better. Thanks to all that work so hard making this event so special every year. Your dedication and hard work are evident and so appreciated. Also a special thanks to all the people who live in the area. I'm sure the closed roads and extra traffic are a pain and you are all appreciated for putting up with it. Can't wait for next year! Always a blast keeping up with the car in front! Also to add our congrats on a great festival..which takes a huge amount of organising!! We drive down from Ontario and enjoy immensely,this is our third year,I think everyone is respectful that this is a special event for us Car people and want to keep it coming every year..
My wife was not really a Car fan.. but enjoys going to the Glen and now asks, "so which SBD event should we do next year..!! 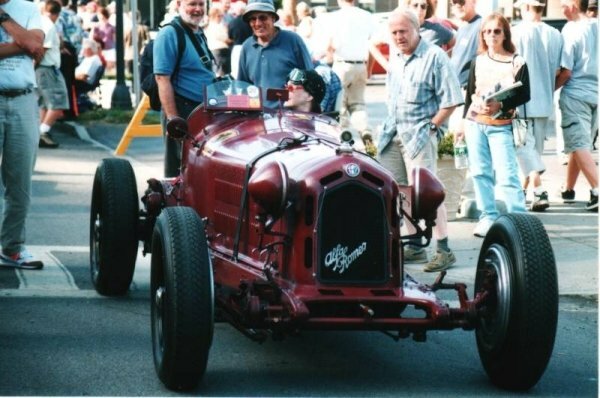 We participated for the first time in the Watkins Glen Grand Prix Festival and were excited to join the Knapp Vineyard Sporting Roadster Tour with our 2009 Mazda MX5 GT. Now that we have arrived at home, we wanted to take a moment to express our sincere thanks to you and all the volunteers for an absolutely fabulous experience. The tour itself was even more fun than we expected. Everyone of the volunteers that we came in contact with was extremely welcoming, polite, and helpful. We felt totally welcomed and "included" in all the events. Congratulations on such a great job in organising the weekend. We will definitely return another year to enjoy the wonderful Finger Lakes Region again. If it is possible, we would appreciate it if you could pass on our thanks to all of the support team who helped create some unforgettable memories for us and hundreds of others. On behalf of our little Corvette group [five couples, all members of the First State Corvette Club], we Thank You for a great Watkins Glen - Grand Prix Festival event. For four couples, this was a FIRST, not only for the GP Festival and becoming Stone Bridge Drivers, keeping up with the car in front of them, but to this area of the Finger Lakes in general. Had the great opportunity to introduce our members to Carole and Casey at WGP. They met Carl at Red Newt for the Founders' Tour. And Terri, the Wonderful Waterfalls Tour was just super, even for 'experienced' Watkins Glen travelers and Festival veterans as we. While we didn't follow the route exactly, the names of the falls and use of GPS made visiting and walking the waterfall trails a most memorable experience. Please, would you convey a sincere Thank You to David from all of us for hosting the Founders' Tour. 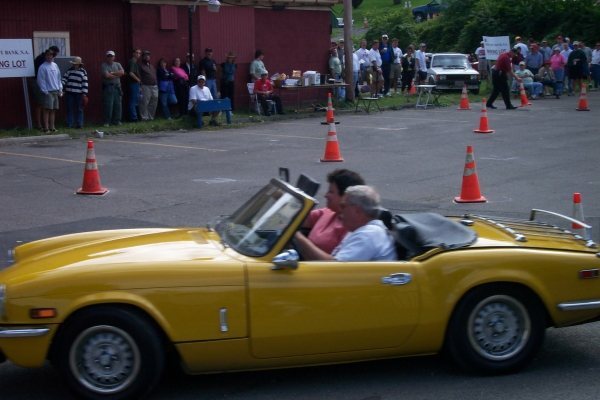 For Linda and I, our first Stone Bridge Drivers event was the Red Newt Founders' Tour back in 2009. We stayed at the world-famous Glen Motor Inn, the motor racing historical significance of your place being what it is, Vic and Linda; we toured around Seneca Lake and Hammondsport, wine tasting along the way. Without the SVRA races we took advantage of Capt. Bill's Seneca Legacy Sunday Brunch Buffet, and dined at Montage/Nancy-gracious as ever, Veraisons and MuraBella's other evenings. Introducing everyone to the IMRRC was an eye-opener for all these guys and girls gear-heads. Vic's Champagne Can-Am car in the center of it all. Even though the SVRA folks were not present en-masse, it did not detract from the overall Festival and GP re-enactment experience. As one of our guy's stated, paraphrasing here, 'it was the best one-day event I have experienced in my Corvette', while his wife said, and this is a quote, "I want to go back next year!" So, we are all-in for 2016. Ladies and Gentlemen, Thank You! to you, your volunteers, your staff for a most memorable experience! Thank you Casey for helping the Glenora Run "keep up with the car in front of you"! On lap #2 the MGB in front of us was pulled at the turn before going up the hill and we peddled our little 71 MGB until we thought she could peddle no more but she performed beautifully and caught up to the group almost half way around the course!!! I'm sure the rest of the group behind us was happy to catch up too! Needless to say, my husband was white knuckled on the steering wheel and pedal to the metal until we caught up!! Our GoPro captured the entire 2 laps, so we will have every minute that led up to what happens when you don't keep up with the car in front of you!! We've been a part of the Glenora group for 5 years now and appreciate every bit of time and sweat you and your volunteers put into the event! We call it our Disney weekend! So keep keeping up with the car in front of you and enjoy!! There can never be enough praise and thanks for people, especially volunteers, who make this special and unique event our favorite weekend of the year. This was our 10th year in the Glenora Run. We have driven our MGs to events all over the US and in Canada. Nothing compares to the Grand Prix Festival. Even without the racing at the track you managed to make this another unforgettable weekend. The tour of waterfalls put us on a great scenic course and made us forget the less than perfect weather.